Pittsburgh is America’s first major Hindu place of pilgrimage. There, on a hilltop in the Penn Hills, is the temple of Sri Venkateswara, also known affectionately as Balaji. In India, the hilltop temple of Sri Venkateswara at Tirupati in southern Andhra Pradesh is one of the most popular of all pilgrimage destinations. Balaji is a form of Vishnu or Krishna and is especially famous for the powerful blessings pilgrims attest to receiving in his presence. American Hindu immigrants have brought the sacred geography of India with them, making Balaji an important part of the American landscape. Several million Hindus come to Tirupati every year and the Tirupati Tirumalai Devasthanams, the corporation that manages the temple complex, is one of the wealthiest corporations in India. 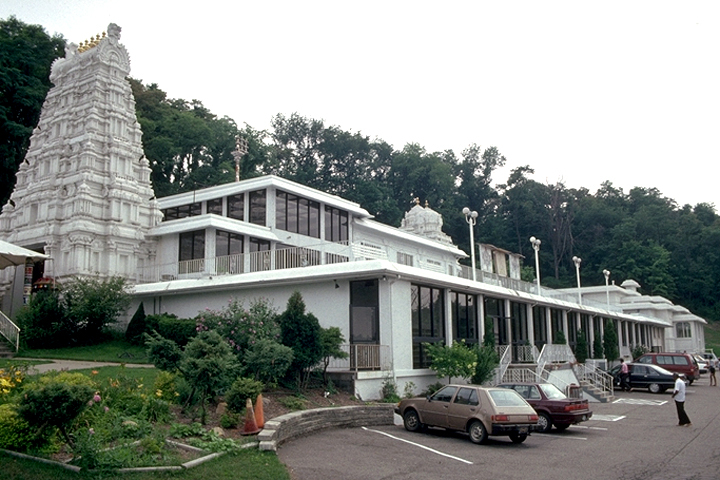 It was through a loan from this Indian temple trust that Pittsburgh’s temple was built. In addition more than 6,000 Hindus, most of them first generation immigrants, contributed to the building of the temple. When the temple was dedicated in June of 1977, it was the first Hindu temple to reach completion in America. The popularity of this temple, even to those far beyond the Pittsburgh area, enabled it to repay its loan to the mother temple in Tirupati in only two years. Today the “S.V.” temple, short for Sri Venkateswara, welcomes tens of thousands of visitors annually, with a record number in 2011. It has developed a pattern of religious celebration that focuses around American holidays and three day weekends, a pattern that has come to be common not only for Hindu communities in the United States, but for Jains, Sikhs, and Buddhist immigrant communities as well. The S.V. temple continues to serve as a model for other temples that have been established in America. The community even supports other temples for kumbhabhishekam, by sending priests to give a religious service, for example. Balaji resides in many locations in America. There is a Balaji Temple in the western suburbs of Chicago in the town of Aurora. The temple in Calabasas, Malibu Temple, just north of Los Angeles, is a Sri Venkateswara temple with Balaji in its central sanctum. 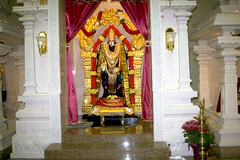 The image of Balaji, while not in the center, has an important place in the Sri Lakshmi Temple in Boston, in the Ganesha Temple in Nashville, and in the Siva-Vishnu temple in Washington, D.C. In the Louisville, Kentucky temple, Balaji’s image was placed and his presence is invoked before construction of the temple had even formally begun. Today, the blessings of Balaji continue to multiply throughout America.